Protect your dog while in the car with booster seats and car seats. 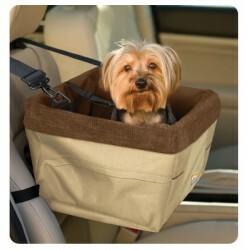 The 3 in 1 Pet Car Seat is the perfect seat for small dogs that like to ride with you in the car! Ou.. These booster seats are made from a dense foam with a removable micro suede cover that is machine wa.. The Booster/Car Seat is a great way for your pet to travel in your car while being comfortable and s.. This Luxury High-Back Console Pet Car Seat allows your pet to sit comfortably up front with you, eve.. Your Doggy wants to Ride in Luxury with a Sky Box View! Want to give your pooch a comfortable, enjoy.. This soft and stylish booster seat will give your little travel companion a charming boost for any r.. Does your Furbaby deserve to Ride in Luxury With a Sky Box View! Then give your pet a comfortable an..
Pet Wheel Around Carrier - Available in 3 Sizes and Colors! The Pet Wheel-Around is a high quality wheeled transport that lets you take your pet almost anywhere.. The Snoozer Luxury Large Lookout Pet Car Seat is for longer dogs or a dog car seat built for 2 buddi..
Spoil your pups with this dog bed, dog carrier, and car seat all in one. With the cozy and soft faux.. This cozy fauz fur reversible Snugglebug is a bed, a carrier, a car seat. . . and it’s a burrow bed!.. Little dogs will command attention in this cool and cozy Camo & Black Reversible Snugglebug! This on.. This reversible 3 in One is sure to please your darling little doggy. It is made with plush faux fur.. This all in one dog bed, pet carrier, car seat and burrow bed will make your dog feel right at home ..
Soft and snuggly...your pet will love the cozy Snugglebug Pet Bed. Bonus for you...it's also a carri..
Spoil your little doggy with love, comfort, and faux fur. Your little one will love this dog bed, do..